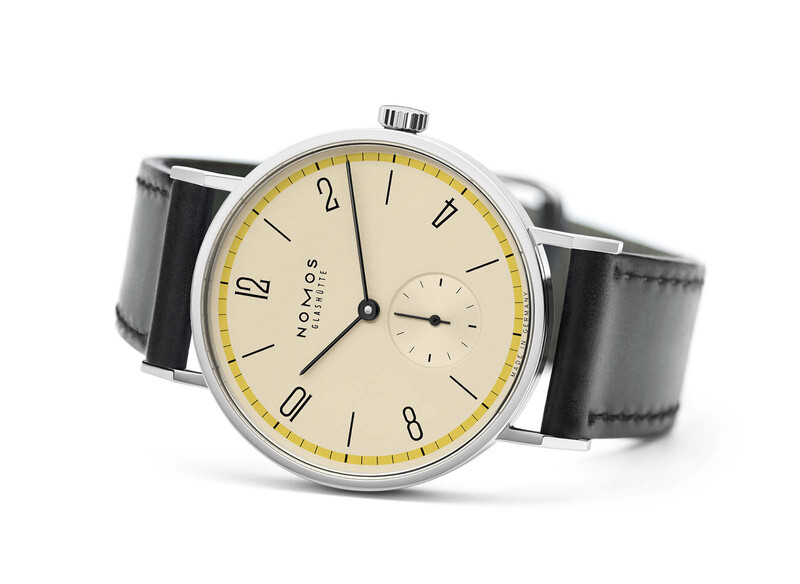 To celebrate the upcoming centenary of Bauhaus – the Staatliches Bauhaus school was founded in Weimar in 1919 – Nomos has introduced a limited edition series of its bestselling Tangente model. 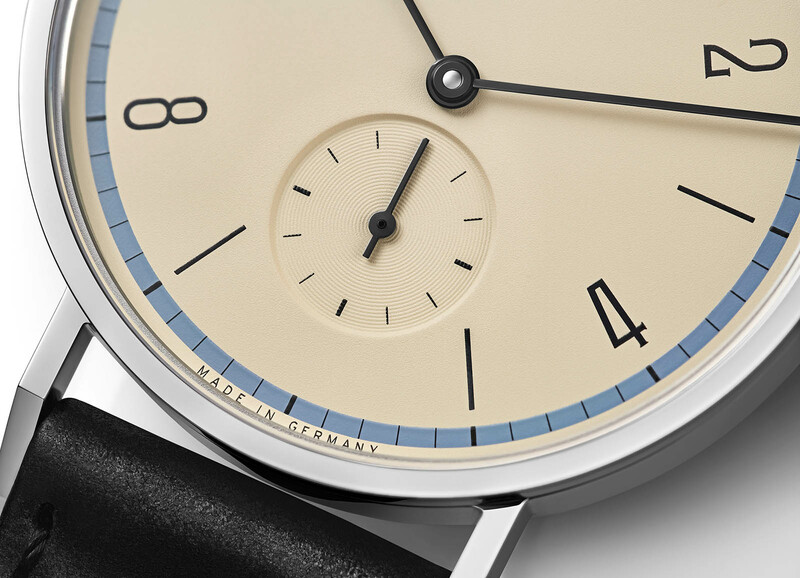 The Bauhaus anniversary line-up totals nine watches, but is actually three models, each available in three case sizes. 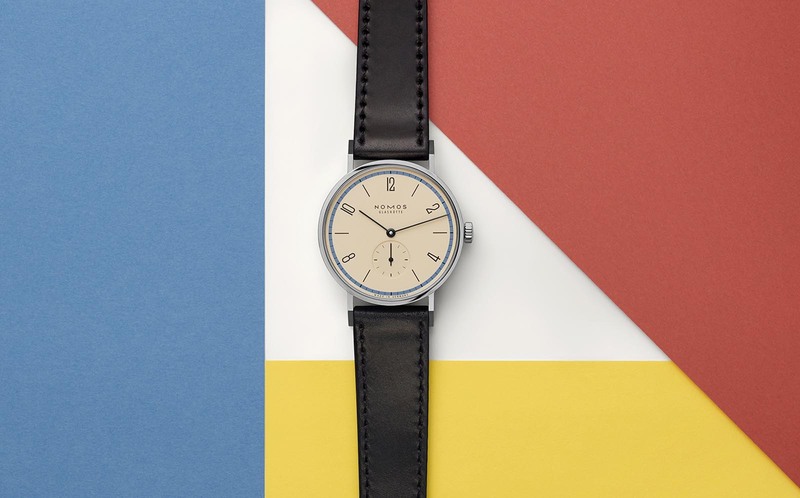 Nomos’ commemoration of Bauhaus’ centenary is perhaps ironic, or even tongue in cheek, since the brand’s design ethos is often wrongly characterised as Bauhaus. Instead it is actually inspired by the Deutscher Werkbund, an early 20th century design movement that aimed to combine artisanal crafts and mass production. Being a predecessor of Bauhaus, the Deutscher Werkbund is visually similar, which is why they are often confused. 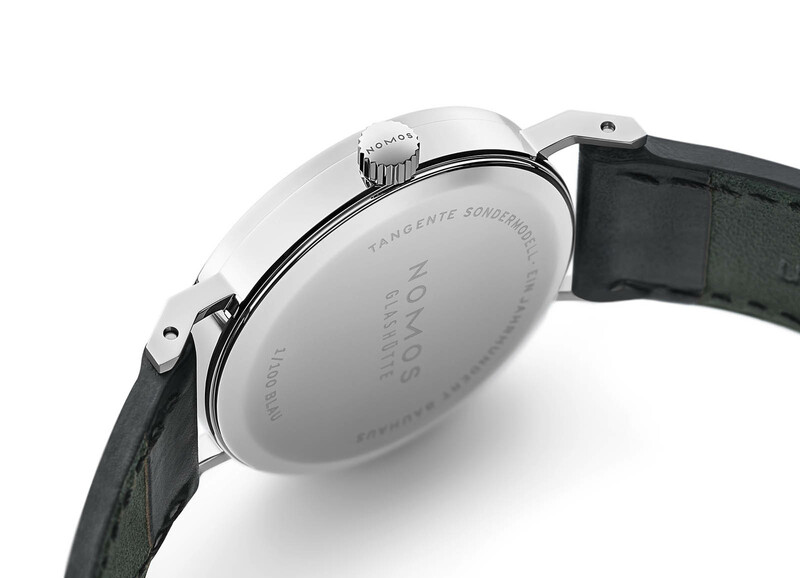 Nonetheless the formalism and pragmatism of Bauhaus can be felt in the Tangente, the first wristwatch by Nomos and arguably its signature timepiece, characterised by thin, angular lugs and large, alternating hour markers. 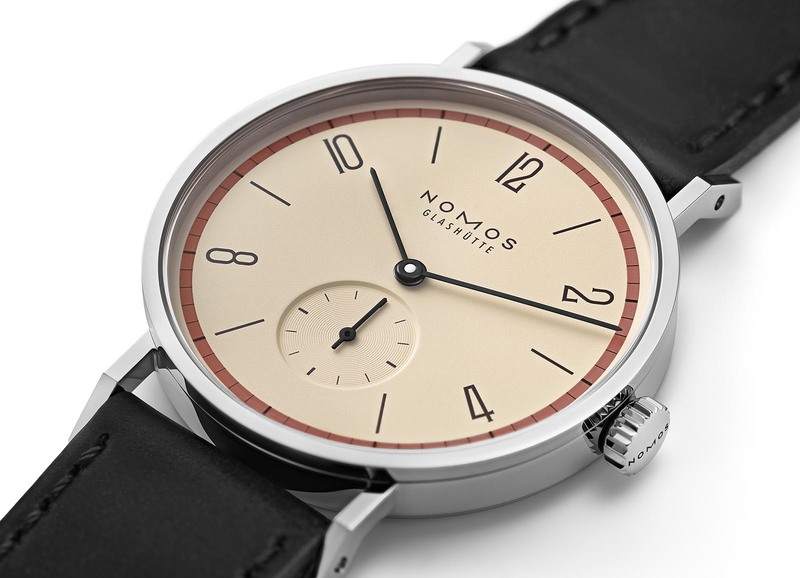 The limited edition features a cream dial that is described by Nomos as “sketch paper”, matched with black numerals and hands. Aptly, each watch features a pale primary colour to mimic watercolour on sketch paper, which takes the form of a red, blue or yellow minute track. Each version in three sizes – 33mm, 35mm, and 38mm. As with all Nomos limited editions, the tweak in design is subtle yet meaningful and distinct enough to distinguish itself from the current Nomos lineup. Hidden behind a solid caseback is the hand-wound Alpha, Nomos’ first in-house calibre that is loosely based on the Peseux 7001 and offers a 43-hour power reserve. 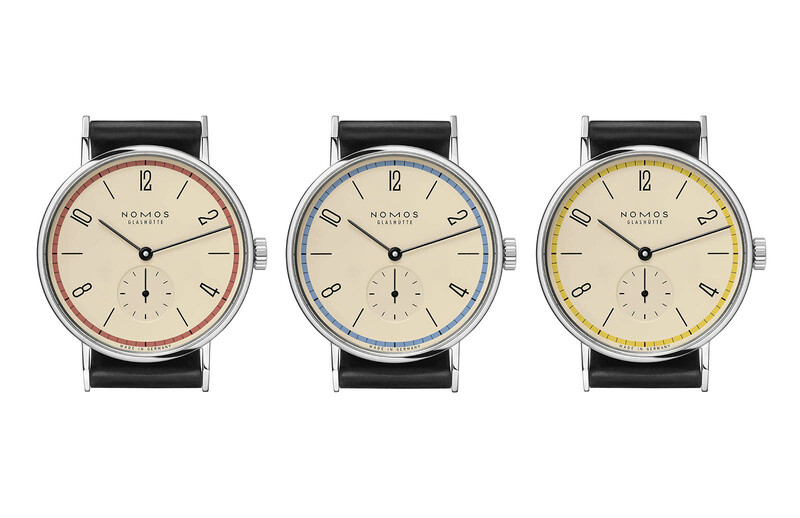 The Nomos Tangente ‘A Century of Bauhaus’ Limited Edition in red, blue or yellow is priced at US$1660 (33mm), US$1800 (35mm), and US$1930 (38mm). Each version is limited to 100 pieces, making the entire run 900 pieces. Delivery starts in September 2018.